As a child, Halloween meant preparing a costume, planning which neighborhood to trick-or-treat in, and waiting for the sun to go down to begin prancing from house to house asking politely (or not so politely) for candy from strangers. In college, Halloween means coming up with up to three different costumes, asking around for addresses of house parties, and trying to make sure you and your friends all get home safely at the end of the night. For halloween last year I dressed up as a cat on Thursday night and Rosie the Riveter on Friday night. By Saturday night I was exhausted, so I didn’t use my third costume. This year I went as a cow (with two others in my “herd”) on Friday night and a bumblebee on Saturday night. 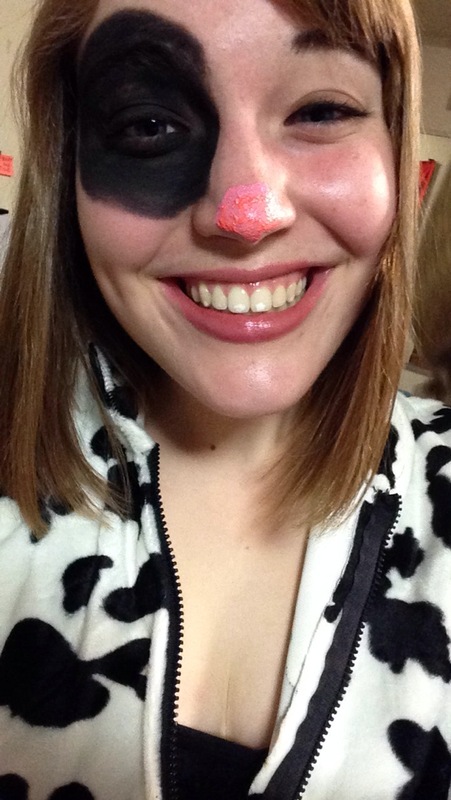 I think my cow costume was fairly obviously a cow, but I got asked if I was a Dalmatian MULTIPLE times. I blame the spot on my eye. We found another guy dressed as a cow, who then insisted on telling me he was lactose intolerant. I fell and ended up rolling down the street I’ll be living on next year, and I scraped my knee in the process. Doing the house party hop often means following people to wherever they’re going, so a ton of kids (my group included) ended up entering someone’s house even though they weren’t actually throwing a party. My bumblebee costume required a lot more construction time than I thought it would: I bought the headband, but I had to make stripes out of tape to go on my yellow shirt. It took roughly an hour for my friend and me to cut, rip, and place the tape. I forgot to get yellow face paint, so I had to awkwardly ask around if anyone had yellow eyeshadow–someone ended up having a palette with lots of bright colors, and yellow was one of them (amen). On Saturday night I played pong (in this case it was water pong, not beer pong) in the dark, and somehow did extraordinarily well considering I didn’t even know that I’d made the shots that I did until the other team moved the cups out of the way. Halloween used to be a holiday that I dreaded in middle school and high school–I always worried that I was too old, or I couldn’t come up with a costume that I actually wanted to execute–but in college it’s become fun again. My favorite part is seeing others’ costumes; some people are extremely clever or brilliant designers. The way I celebrate may have changed a lot from when I was younger, but the spirit of Halloween isn’t lost forever. Ah, role reversal. I love it. What’d you go as? It’s true that some people are more into the party than the reason for the party. Poison Ivy circa the Arkham games :) Minus the green body paint – I couldn’t convince myself that an after-party shower would be a successful one. Yeah, I’ve noticed it’s often hard to get people to join in on a party’s theme, which I always think is a shame, but I guess it depends on your circle.